My primary interest concerns photography. 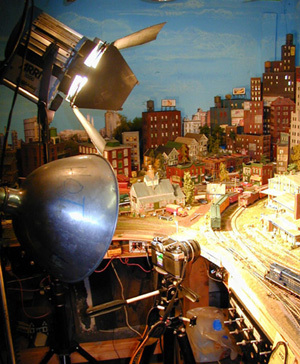 It was because of photography that I became involved with model railroading. I was looking for something to serve as a divergent from shooting "still life" pictures and model railroading seemed to be the best way to go. At first I used a 2 by 2 foot board that served as a base for me to place model scenes upon. As I thought of a particular scene, I would purchase the required models, detail them and set up the scene to photograph. As a result I managed to accumulate a large inventory of model structures, rolling stock, figures, detail castings and a few engines, which prompted me to construct a layout. I learned to assemble models and scenes to look as prototypical as possible while reading what the more advanced modelers were doing and looking at my surroundings. I also learned that photographing model scenes was not as easy as photographing still life pictures. Model photography required more thought and frequent trips to and from the scene after viewing the scene through the view finder of the camera to make subtle adjustments. To photograph model railroad scenes the biggest requirement is ample lighting and a scene that is void of flaws that will indicate a model looking picture. Below, I will indicate my preferences to photographing model scenes. (See Models or Prototype) pictures. 1- A sturdy tripod because of the long exposure time required to take these pictures. 2- A good Single Lens Reflex (SLR) or similar camera. 3- For "HO" scale models I like to use a 28mm or 50mm lens attached to a 2 times teleconverter. Any camera lens will work. 4- An 80A or 80B filter attached to the front of the lens when using daylight balanced film. These filters will balance the film for tungsten lighting and prevent the orange warm tones that will otherwise be created when the film is processed. 5- As for lighting, I use a professional 1000 watt lamp (1K) with barn doors and two 250 watt lights used as fill lights to fill the shadow areas of the scene. Sometimes, I'll use a bounce card to reflect subtle light into shadow areas. The above picture shows a 1K light with barn doors and one 250 watt fill light lamp along with the camera attached to the tripod. Caution: Which ever lighting source you elect to use, remember that these lights can get very hot which can cause burns, melt plastic or start fires. Therefore, use common sense when using hot lights. The above picture was taken outdoors on the old 2 by 2 foot board that I started with. The above equipment mentioned is all I use to take pictures of model railroad scenes. Everyone has their own preferences to achieve their pictures. The main point is to have fun with what you do with your photography and to enjoy doing it.